ADD and mono except for the Bax and Butterworth. The imaginative impetus and fierily poetic conviction which Barbirolli breathes into Bax's Fand should make us all lament that he never recorded Bax's Fifth and Sixth symphonies both works that he conducted with the Hallé at the Proms and the Cheltenham Festival during the 1950s. But the return to the shop-shelves of this work and of the Butterworth, after so many years, is a matter for celebration. The last time this was listed was in the 1980s on a PRT CD in a carbon copy of the original Pye LP. Incidentally, the Grecian-styled cover of that LP is reproduced on the back of the Dutton booklet. A very nice touch. The Butterworth suffers somewhat from the stress of almost fifty years since the recording sessions it shared with Fand at the Free Trade Hall, Manchester in June 1956. The strings do not sing with quite the succulence for which you would now ask and the fortissimo outbursts sound mildly stressed. Lovely playing though with some confidently close up balances for some of the solos. Similar close-ups in the Bax seem entirely natural although one would never hear the celesta with this clarity in the concert hall. Still, in the case of the Bax, this is the best performance in the catalogue and will take a lot of beating. The rest of the set is in mono. The three Ireland works are extremely well done. The Forgotten Rite is a work of druidic suggestion from the pagan history of the Channel Isles - especially Jersey. The Hallé's first oboe really marks out his solos stressing the links with the Russian romantics. Barbiirolli takes the work at a concentratedly expansive rate. Great work also from the harp, horns and strings. Barbirolli knew well the value of dynamic variety and used it just as much as tempo and balance shifting. After the subtle mysteries of the Rite we come to the trudging dogged conflict of Mai-Dun where mystery is less an issue and truculence and defiance are the order of the day. If parallels can be drawn with Bax, Mai-Dun is to the Forgotten Rite as Northern Ballad No. 1 is to Nympholept. These Things Shall Be has come in for a lot of stick. There is the irresistibly utopian naivety of the words of John Addington Symonds and the lingering and objectionable resistance to a work that (ever so discreetly) quotes The Internationale. Barbirolli gives the work the best performance I have heard and certainly leaves the Boult (Lyrita Recorded Edition LP) way behind. This one has an all-conquering onward rush. We must remember that the work dates from the same era as Britten's Ballad of Heroes, Alan Bush's Piano Concerto (with even more challenging words set à la Busoni in the finale) and all of this against the background of the Spanish Civil War and with thoughts, still fresh, of European battlegrounds and white gravestones stretching into the far distance. The Hallé Choir blaze out in flaming tones. A pity that the tape sounds stressed or afflicted with warble or wow just once or twice. But these are trivial demerits when measured against the performance and I do urge you to hear this and to turn up the volume. Barbirolli gives this work the performance of a lifetime and surely Ireland must have been pleased with this. And when the great choir, in a whisper, reach out to you with the words 'Say heart what shall the future bring?' I defy you not to shiver. The words are printed in full. If you are looking for a musical experience that transcends the workaday then this is it! Yes, flawed in sound but perfection in its emotionally targeted reach and sincerity. The second disc covers much more familiar British territory. Greensleeves is released for the first time on CD as is the Tallis. Both are from sessions at the Houldsworth Hall, Manchester in 1948 and 1946 respectively. The same venue was used for Barbirolli's classic version of Bax 3. Both works have inwardness and a richness of tones uprising in recordings of their age. They do not displace the famous EMI Sinfonia of London version coupled with the Elgar Introduction and Allegro but they are well worth hearing. I was rather taken by surprise by the Greensleeves - a work which hitherto I had regarded as lightish confection. Barbirolli handles it with such easeful care that I was left wondering about it. The Enigma has never been issued before and proves to have plenty of character. His Troyte is taken at a rip-snorting rate. The last time I heard something like this was with Norman Del Mar and the RPO (I still hanker after that performance - once available on Polydor). No-one is clear why this recording was not used but for some reason the orchestra and conductor went back into session in October the same year and re-recorded it. The October performances was issued. 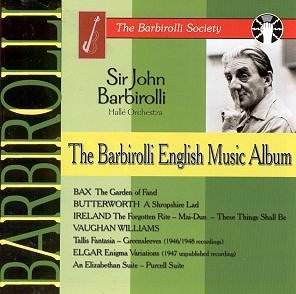 Barbirolli manages the hiccup and dolly-lilt of Lullaby just as well as the light music insouciance of his own Elizabethan Suite and his Purcell-based suite for strings. I noticed some problems with a low-level scudding noise on the final Elizabethan tracks. Dutton dot every i and cross every t with immaculate and comprehensive attention. Michael Kennedy's notes are no mere also ran. There are some extraordinary things in this collection; indeed the first CD is outstanding and should be in the collection of any British music enthusiast.